This artist's concept depicts NASA's Voyager 1 spacecraft entering interstellar space, or the space between stars. 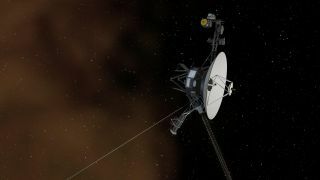 Beyond the border of interstellar space, the distant Voyager 1 spacecraft called back to Earth earlier this year with noises from its new environment. It's true that the void of space does not carry sound — there's no gas or other substance to transmit the waves — but the signal Voyager detected can be played back at frequencies the human ear can understand. NASA announced in September that Voyager 1 had left the heliosphere in August 2012. The heliosphere is a sheath of magnetic influence that emanates from the sun and expands through a stream of charged particles called the solar wind. At the press conference, Don Gurnett, the principal investigator for Voyager 1's plasma wave science instrument, demonstrated a series of sounds the instrument had picked up. "Strictly speaking, the plasma wave instrument does not detect sound. Instead, it senses waves of electrons in the ionized gas or 'plasma' that Voyager travels through," NASA stated in a statement. These waves, however, do take place at frequencies that humans can detect. Within the heliosphere, the sounds had a frequency of about 300 Hz. Once Voyager left the scene, the frequency jumped higher, to between 2 and 3 kHz, "corresponding to denser gas in the interstellar medium," according to the NASA release. This image is a visual representation of the sound of interstellar space recorded by NASA's Voyager 1 probe, which entered interstellar space in 2012. There have been at least two verified instances of these tones: October to November 2012, and April to May 2013. Both occurred after huge coronal mass ejections (material from the sun) bumped up plasma activity around Voyager 1. There was a lag before scientists discovered the recordings because the data is only played back every three to six months, NASA said, and more time is required to interpret the results. Gurnett further speculated that "shock fronts" from beyond the solar system could be tearing through interstellar space and disturbing the plasma surrounding Voyager 1. He will be listening for any evidence of this activity in future recordings from humanity's furthest spacecraft, he said.